﻿﻿15 Super Tips for a Productive Summer Veggie Patch! Whether you are tucking things into niches between ornamental landscape plants, planting a patio patch like in the image, setting up a first time summer garden patch, or replanning your annual garden, here are some great ideas to increase your production! 2. Keep in mind veggies need sun! 6 to 8 hours, preferably 8! They are making fruit, and often many! That takes energy. 3. Put tall plants to the north (see image below), so they won’t shade the shorties. If there is a partially shaded area, plant your tallest plants on the shaded side so they can reach up to get some sun; put the shorter plants in decreasing heights, in front of them so all get as much light as they can. When you are planting rounds, another batch every few weeks, start in the north or the ‘back’ – the shaded area, and work your way forward. 4. Trellises and tall cages are terrific space savers and keep your plants off the ground out of harm’s way – pests, diseases, damage. Your veggies will be clean, and have more even ripening. Cucumbers, beans, tomatoes. Squashes and melons can be trellised if you provide support for heavy fruits. Even Zucchini can be grown up through cages leaving a lot of ground space for underplantings. Harvesting is a lot easier and certain when those fast growing zuchs are up where you can see them! 5. There are rows and there are rows! Single row planting wastes space! Compare the images. If you do rows, plant 2 or 3 different plants in side by side rows, then have your walk way, then another 2 or 3 plants together. Whether you do 2 or 3, or even 4, depends on plant size, your reach, and ease of tending and harvest. Plant taller or medium size plants, like peppers and eggplant, by twos so you can reach in to harvest. Plant shorter smaller plants like lettuces, spinach, strawberries together since they are easy to reach across to harvest. 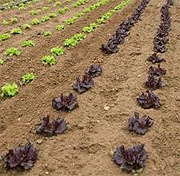 If plants in the rows are the same size, plant the second row plants on the diagonal to the first row plants. That way your rows can be closer together and you can plant more plants! 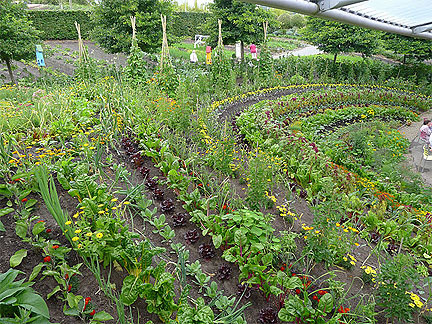 Attractive Multi-row Veggie Amphitheatre around the Eden Project restaurant! 6. Rather than rows, biodiversity, mixing things up, confuses pests, stops diseases in their tracks, because they can’t just go from the same plant to the same plant down a row. Since we are not using tractors, there is no need for rows at all, but they can be lovely. The curved rows in the image are behind the Eden Project restaurant outdoor seating! Truly garden to table! 7. If you need only a few plants, rather than designating a separate space for lettuces and littles like radishes, tuck them in here and there on the sunny side under bigger plants! When it gets big enough, remove the sunny side lower leaves of the larger plant to let light in. 8. Plant what you like, and will really eat along with some extra nutritious chards, kales. 9. Plants with the same water needs are good together. Like a salad patch – lettuce, arugula, spinach, bok choy, bunch onions, radish, chards. Putting the things together that you will harvest together saves time! Put carrots at the foot of pole beans. 10. Overplanting can take the fun out of things. Too many zucchini in hot summers, and you are going crazy trying to give away the over large ones you didn’t harvest soon enough. Too many green beans are labor intensive harvesting, takes forever. Planting green beans too close together is hard to harvest, and they mildew more with low air circulation. Overplanting is delicious when you plant lots of lettuces, carrots then harvest what you thin out! That’s baby kales, chard, mini carrots. These are the eat-on-the-spot-in-the-garden types! 11. Traditionally, and if you lived in the North with cold winters, you planted the garden all at once in spring! If your parents did that, you are unthinkingly likely to do it as well. In our SoCal Mediterranean climate, we plant all year though there are warmer and cooler veggie seasons. But each of these seasons are longer, and overlap! It is easy to get 3 plantings in succession IN EACH SEASON! Some plants will grow all year, mostly the ‘winter’ plants in our coastal gardens, for example, beets, broccoli, onions and cabbages. It takes strength to leave open space for successive rounds. But you can do it. Mark that space off, plant temporary fast growers, nitrogen-fixing fava, or lay down some soil feeding mulch like seedless straw. That space will be super productive when its turn comes. 12. Pole plants, have a lot longer production period than bush, like beans! Indeterminate tomatoes are true vines, can last all season long, but are susceptible to Fusarium and Verticillium wilts/fungi diseases. Might be better to plant determinates, limited growth varieties, in succession. That’s plant a few, then in a few weeks a few more, and so on. Let the determinates produce like crazy all at once, pull them when they show signs of the wilts. If you have only a small space available, or want to do canning, then bush plants are for you! 13. Plants that act as perennials in our climate are smart money plants! Broccoli’s for their side shoots, continuous kales and chards. 14. Special needs or companions! Eggplants, though heat lovers, love humidity, but not overhead watering. Put them among other medium height plants. Basils are great on the sunny sides of tomatoes, and go to table together. Corn needs colonies – plant in patches versus rows! Every silk needs pollination because each produces a kernel! The best pollination occurs in clusters or blocks of plants. Consider that each plant only produces 2 to 3 ears, usually 2 good ones. How many can you eat a once? Will you freeze them? The ears pretty much mature within a few days of each other! So, if you are a fresh corn lover, plant successively only in quantities you can eat. 15. Consider herbs for corner, border, or hanging plants. They add a beautiful texture to your garden, are wonderfully aromatic, repel pests! Remember, some of them are invasive, like oregano, culinary thyme. Sage has unique lovely leaves. Choose the right type of rosemary for the space and look you want. Please be CREATIVE! You don’t have to plant in rows, though that may be right for you. 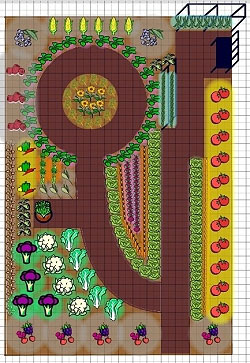 Check out this Squidoo Vegetable Garden Layout page! Check out the Grow Planner for Ipad from Mother Earth News! They may make you very happy! This is a perfectly acceptable way to play with your food. Merry May Veggie Gardening to You! Carpenter Bee - Male, AKA Teddy Bear Bee! 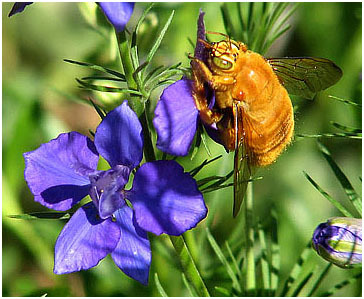 April 15, 2011 I had my first encounter with a huge male carpenter bee – see image! Awesome! They are all fuzzy and yellow (not all black like the females), sometimes called Teddy Bear Bees, and I could totally see why! They hover closely and look you right in the eye, buzz off and come back for another look! They are the largest bees found in California, don’t sting. What a pollinator! Magic May, Mama Earth’s Bounty Month, It’s Cantaloupe Time!! Keep planting your summer veggies and year-arounds! If you haven’t put in the summer heat lovers, do it NOW! That’s peppers, eggplant, okra, melons. Absolutely get winter squash in now. It takes time to mature and harden. Beans, beets, carrots, chayote, corn, cucs, summer lettuce varieties, pumpkins, radish, zuchs, chard, tomatoes, more tomatoes, turnips! Omigod, I’m hungry! Harvesting is like pruning, no? So eat! Keep your plant producing by steady picking and plucking, no storing on the vine! Otherwise, it thinks it did its job, made those seeds, and folds up camp! Keep your broccoli harvested. If you see flower stalks, cut them off ASAP, back to where new shoots can come. If you are getting too many sprouts, cut them back further to slow them down. Eat those bitty zuchs, flowers and all! Use those herbs you planted – basils, thyme, sage, oregano. Just a few of their leaves rubbed, mashed, steeped, chopped, can add luscious flavors! Make pretty bouquet garni for giveaways! Parsley is SO good for you, and beautiful in your garden! Its second year it goes to seed, a biennial. Pull and cook the tasty roots in your soup, or let a plant or two go to seed to feed beneficial insects and reseed your patch. Oh yes, and, of course, plant cosmos, marigolds, petunias, sunflowers, sweet alyssum, your favorite summer flowers! APRIL is for Heat Lovers! Pull back your mulches, let soil heat up, PLANT! Why not start with an AAS (All America Selections) 2011 Winner?! 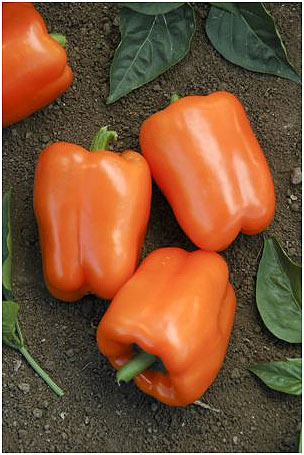 Pepper ‘Orange Blaze’ F1 Early ripening orange variety, very sweet flavor, multiple disease resistances! Get out last year’s garden notes if you made any, and review for varieties you liked, where you got ‘em, how much to plant! Plant in blocks, not rows, for pollination. When tassels bloom, break off pieces and whap them on the silks! Each silk is one kernel, each needs one grain of pollen! Corn hybridizes – plant only one variety, or varieties that don’t have pollen at the same time. This is pretty much not doable at a community garden since everyone is planting all kinds at any time, so if you harvest seeds, don’t expect true results! Eggplant love humidity and heat. Tuck ‘em in between, right up against, other plants. Near the cooler coast plant the longer length varieties that mature earlier. From Seed: basil (Nufar is wilt resistant), chard, green beans (while peas finishing), beets, carrots, corn, endive, New Zealand spinach, parsley, radish, squash – summer & WINTER, sunflowers, turnips. Coastal gardeners, get your winter squash in NOW so it will have ample time to mature. The radish variety French Breakfast holds up and grows better than most early types in summer heat if water is supplied regularly. Plant successively! If you put in transplants now, also put in seeds for an automatic 6 week succession! Plant different varieties (except of corn if you want true seed – see above)! If you overplant, thin for greens, or transplant when they are about 2 to 3 inches high. Lettuce, carrots, onions. Too many stunt each other. OR, this from Santa Barbara Westsiders Lili & Gabor: Overplant mesclun on purpose, then mow the little guys! If you are at home, plant densely in a planter bowl, cut off, leaving 1 ½” of stem still in your soil. They will regrow, you will have several months’ supply of tasty baby greens. Plant two or three bowls for more people or more frequent harvest! Give a bowl as a gift! Plant for excellence – Throw a handful of bone meal in your planting hole along with a handful of nonfat powdered milk, worm castings, compost/manures, mix it all up with your soil. Sprinkle the roots of your transplant with mycorrhizal fungi! That’ll do it! Stand back for bounty! REMOVE LOWER LEAVES OF TOMATOES Wilt prevention. Water sparingly or not at all after about a foot tall. Wilt comes from the ground up the leaves and is airborne. Remove any leaves that touch the ground or could get water splashed. Don’t remove suckers – airborne fungi can enter open wounds. Sorry, NO HEIRLOOMS if you know the soil has the wilts. Heirlooms don’t have resistance. Get varieties with VF on the tag or that you know have resistance/tolerance. Mid day, rap tomato cages or the main stem, to help pollination. 55 degrees or lower, higher than 75 at night, or 105 in daytime = bud drop. Not your fault. Grow early varieties first that tolerate cooler temps. Pilgrim Terrace Community Garden Kevin and Mary Smith have had successes with 2 blight resistant/tolerant determinate varieties, New Hampshire Surecrop, a 78 day, great tasting slicer/canner, and Legend, a very early 68 day! Ask for them, and more Jetsetters, with unbelievable VFFNTA resistance/tolerance, at your nursery. See Tomatoes and Wilts here at the Green Bean Connection Blog for a list of additional resistant/tolerant varieties and tips! Maintenance! Sidedress when blooms start. Fish/kelp, foliar feed Epsom salt for Solanaceaes, seabird guano (not bat) for more blooms, manures for lettuces and leaf crops like chard, collards. Another weed that isn’t a weed! Purslane, (Portulaca oleracea) is an annual originally from India but long grown as a vegetable in China, England, and even in Australia by the Aborigines. It thrives in full sun, poor soil and drought. No known insect or disease problems. Garden purslane is upright, a cleaner harvest, not the little mat plant. In good conditions, it grows over a foot tall! Pinch off tops to get it to ‘bush.’ Once started, let it self sow. The ground cover type is also edible though not as convenient. Purslane Power! Purslane contains one of the highest known concentrations of Omega-3 fatty acids — five times the concentration in spinach. 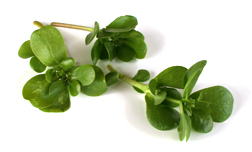 Chickens grazing on purslane produce high omega-3 eggs. In Mexico, called verdolaga, it is eaten in omelets, as a side dish, rolled in tortillas, or dropped by handfuls into soups and stews. I simply add it raw to salads. Precaution: Individuals with a history of kidney stones should use purslane with caution as it may increase kidney filtration, urine production, and possibly cause a stone to move. Purslane injection induces powerful contractions of the uterus, but oral purslane is said to weaken uterine contractions. Avoid use during pregnancy. 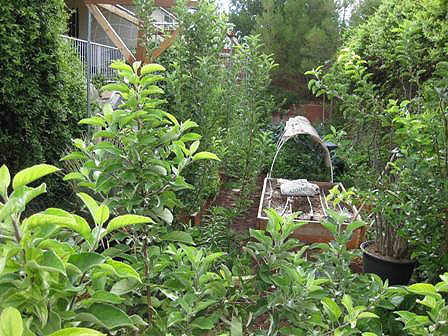 Mary Lynn Schlomkowitz, Plot 42, Pilgrim Terrace Community Garden, says: Enjoy your fresh herbs – OREGANO is a favorite of her family! Harvest long stems of it (full length and this will vary depending on plant size.) Rinse off dust, strip the leaves off the bottom of the stems for about 4 inches and place them in water. You will have fresh oregano for several days. Chop the stripped leaves for cooking or to add to the top of a salad. If you picked a lot of stems, you may want to dry some leaves and store them in a tight jar in a dark cupboard. Set them to dry between paper towels in a sunny indoors spot. The top paper towel keeps the leaves from turning black as they dry. Fresh herbs are delicious and now I understand why people in northern climes in earlier times eagerly awaited spring so they could resume eating fresh herbs. They are also nutritious. We are so spoiled in the Santa Barbara area that we can enjoy fresh herbs year round. Enjoy great health and tasty feasting!